As noted elsewhere, adaptive management is a systematic process for continually improving management policies and practices by learning from the outcomes of operational programs. Outcomes need to be science-based and measurable. The Newport Bay Conservancy (NBC) is committed to this science-based approach to resource management at Upper Newport Bay (UNB) and in its watershed. NBC continues to catalog and analyze the universe of information pertaining to biology, water quality, etc. and has prepared a preliminary report identifying data gaps that need to be filled as part of the development of a Comprehensive Resource Management Program (CRMP) for the entire Upper Bay and adjacent land. This document research is a vital exercise to help ensure that baseline and continuing monitoring is done efficiently and effectively in support of resource management and environmental protection objectives. To be worthwhile, such monitoring must be performed in such a way as to show success or failure in meeting the desired objectives, and it must be performed in a scientific manner to ensure confidence in the results. In simple terms two things are needed – an ongoing comparison of results of monitoring at the same locations using the same protocols at regular time intervals, and an ongoing comparison of results of monitoring at the same times using the same protocols at similar locations. 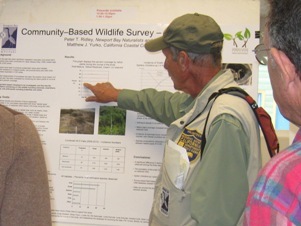 The light-footed clapper rail monitoring discussed under Wildlife Monitoring is a good example of the necessary rigor.